The planned significant increase in EU spending on research and innovation is both an opportunity for the Region of the Tyrol and an important step towards strengthening competitiveness and prosperity in the EU and the regions. Research needs to be brought to market faster in the form of products, services and procedures. “Research and innovation are prerequisites for new products, services and processes that help companies survive in the market and secure jobs. Investing in research and innovation is therefore an investment in our prosperity and our security,” explains Patrizia Zoller-Frischauf, Regional Councillor for Economic Affairs, Tyrol, welcoming the EU Commission's plans to significantly increase expenditure in the coming EU budget for the period from 2021 to 2027. The EU's most important research funding instrument, “Horizon 2020” was allocated under EUR 80 billion in the current EU budget — it is planned to increase this sum to EUR 100 billion in the next budget under the name “Horizon Europe”. “However, funds alone create neither products nor jobs. In the future, we will need to achieve a greater return on this investment, i.e. by bringing more products to the international market faster and also via closer coordination of regional, national and EU initiatives to strengthen innovation work,” emphasises Councillor Zoller-Frischauf. Europe currently accounts for seven per cent of the world's population, 20 per cent of global research and innovation spending, and one third of global scientific publications. Within the EU, however, there are strong regional disparities; furthermore, countries like the US and China are overtaking Europe in the development of marketable products and services. At regional level, therefore, a number of measures are being taken. Free access to research results is being accelerated: “In accordance with the respective valid subsidy agreements, research results of publicly funded science projects will in future be made accessible to third parties in order to trigger additional product development,” explains Councillor Zoller-Frischauf. Furthermore, by 2020, Standortagentur Tirol will actively support 500 Tyrolean companies with various growth projects in order to drive innovation and increase added value and productivity in the Region of the Tyrol. In addition to consulting services for state-owned funding programs, Standortagentur Tirol also supports companies in obtaining EU and federal funds. Since 2014, Tyrolean companies have collected EUR 39.5 million in funds from the EU's ongoing research funding program “Horizon 2020”. This places Tyrol fifth in a comparison of the Austrian federal states. “Tyrol still has room for improvement here,” explains Zoller-Frischauf. The EUR 150 million budgeted for the Region of the Tyrol’s digitisation offensive should enable Tyrolean companies to increase their value added and innovative power, while also ensuring equal opportunities in the economic development of the regions. The goal of the Startup.Tirol initiative, which is co-financed by the Region of the Tyrol, is to create at least 35 start-up companies in the higher education sector by 2022 and implement entrepreneurship courses at universities. These regional measures go hand in hand with the focus areas planned by the EU Commission. “The promotion of excellent basic research from the laboratory to the market, the focus on research into social problems such as cancer and clean traffic, which do not stop at national borders, and measures to make research results more economically efficient, such as the development of prototypes, are three cornerstones of the EU Commission's research strategy”, says Jean-Eric Paquet, Director-General for Research and Innovation at the EU Commission. This requires making the EU budget more flexible, facilitating participation in EU funding programs and reducing the administrative burden on public authorities and funding recipients. The regulations governing state aid should be simplified to make it easier to combine EU budget instruments and national funding initiatives, says Paquet. He claims the EU Commission also wants to create open access to research results, as implemented in Tyrol, at the European level and, as also with other EU funds, to take greater account of regional particularities regarding research and innovation. Councillor Zoller-Frischauf today opened the “Week of innovative Regions Wire 2018” with Jean-Eric Paquet and Barbara Weitgruber, section head at the Austrian Federal Ministry of Education, Science and Research. 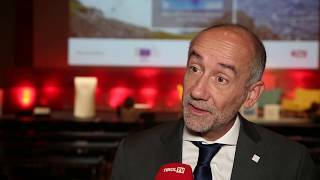 Wire 2018 will take place today and tomorrow in Innsbruck as part under the auspices of the Austrian EU Council Presidency. 200 regional, national and EU innovation experts and stakeholders such as public authorities, policy makers, researchers and entrepreneurs will discuss ways to drive innovation at EU and regional level. According to section head Barbara Weitgruber, the Austrian EU Presidency is not only focusing on security and stability under the motto “A Europe that protects”, but also on securing prosperity and preserving the competitiveness of the EU — and this is where research and innovation play a central role. It is also about strengthening people's trust in the EU's ability to solve problems. Here again, research undertaken on the basis of evidence-based policies can make an important contribution — as shown by the many special events organised under the Austrian Presidency. Against the background of new European funding instruments, competitiveness means turning to knowledge-based and innovation-led location policies and profiling, explains section head Barbara Weitgruber. The role of research and higher education organisations as the lead institutions in their regions and partners for business and society is being rightly highlighted during this year's “Week of Europe's Innovative Regions” in Innsbruck, she says. “In addition to the negotiations on Horizon Europe and the Council’s findings on the future of the European Research Area, we want to highlight the role of sectoral policies in determining research policy — such as the respective regional policies at the WIRE conference. In the current Horizon 2020 EU funding program, Austria is among the three most successful member states in terms of its success rate and is a net recipient, having acquired more than EUR 870 million in funds. This can only be achieved with outstanding researchers at universities and polytechnics, non-university research institutions and companies — from SMEs to large industrial companies — as well as a well-designed advisory and support structure. We want to continue on this successful course via the upcoming “Horizon Europe” programme,” says section head Weitgruber.